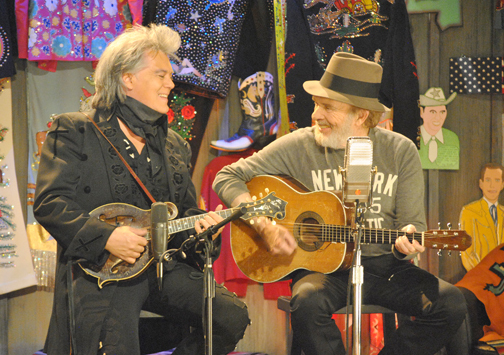 Marty Stuart and Meryl Haggard perform on RFD-TV’s “The Marty Stuart Show.” “Marty Stuart comes in to edit his shows. He sits down and makes sure they look great. He’s very involved. He’s the greatest. He always has cool shoes,” says Kelly Kantz, general manager of RFD-TV’s Nashville production facility. RFD-TV bills itself as “Rural America’s Most Important Network,” and there was a time when provincial Music City would have been its core audience. Today, Nashville has an urbane, glitzy, polished image. It’s the city of pop-country divas Taylor Swift and Carrie Underwood, the home of business headquarters with global reputations, and sprawling, non-stop construction featuring a new, state-of-the-art convention center downtown. Despite the city’s contemporary feel, just a few miles away from downtown, the RFD-TV folks have staked their country claim at NorthStar Studios, where they produce entertainment and music shows that plug into a down-home, honky-tonk spirit that is timeless. Owned and operated by Rural Media Group, an Omaha, Neb.-based satellite and cable enterprise, RFD-TV is available in 41 million households nationally and is beginning to reach out to an international audience showcasing Middle America’s traditional lifestyle, culture and values. Other properties in the Rural Media Group include Rural TV, FamilyNet, RFD-TV The Magazine and the RFD-TV Theatre in Branson, Mo. “Where we want RFD [TV] to be, of course, is to pick up another 15 to 20 million households, as well as continue to showcase rural lifestyles to the U.S.,” says Randy Bernard, the chief executive officer of Rural Media Group. “And I think we do it in four quadrants, really. “And that’s agriculture; equine, which goes from everything to rodeos to horse clinicians; and country living, where what we really want to do with this is focus on bridging the country people with the city folks with the way of life of a rural lifestyle; and then the last one is music and entertainment. RFD-TV’s founder, Patrick Gottsch, has gained respect in Nashville circles. After a stumbling launch in the 1990s, RFD-TV has seen a huge growth spurt since its not-for-profit re-launch in 2000, especially in the last six or seven years when it became a for-profit network. “Patrick Gottsch is a visionary,” Black says. “He envisioned a cable system that would serve the needs of the rural community. Then Patrick realized country music was very much a part of that, so he got with Ralph Emery and Jim Owens. Jimmy Fortune, who sang with the Statler Brothers for 21 years before embarking on a solo career following the band’s 2002 retirement, is also a big fan of Gottsch and RFD-TV. “It took somebody like him to take a chance,” Fortune explains. “And he could foresee what the rest of us could see. A recent story in the Omaha Herald-World quoted Gottsch – who in a 2010 Forbes article was labeled the “Ted Turner of rural TV” – as projecting revenues of $50 million this year and $100 million within three years. “It turned out to be a blessing that we didn’t get financing from an outsider,” Gottsch told the newspaper. Kelly Kantz is general manager of RFD-TV’s Nashville production facility, where all the music shows are taped and a daily five-hour, rural-news program is created and produced. Kantz and Bernard agree the Nashville sound will always play a major role in the future of RFD-TV. “I like it here in Nashville. It’s a good fit. You can get a lot of people here in Nashville,” Kantz says. “Of all of our shows, a lot of our music shows are recorded here at NorthStar Studios. It works out really great, because a lot of the entertainers live here. It’s exciting. “Marty Stuart comes in to edit his shows. He sits down and makes sure they look great. He’s very involved. He’s the greatest. He always has cool shoes. “Ronnie Reno does his bluegrass shows here. Larry Black does his country family reunions and country diner shows here. And then there are the shows that really cater to the rural lifestyle. “Patrick Gottsch, the owner, wanted to do something that wasn’t being done. It’s a market day report,” Kantz explains. “It’s news, weather, commodities and anything that anybody in rural America would want to know, they’re going to find it in this market day report. And that’s the audience advertisers are trying to reach, says Ann Tarter, executive vice president of Tarter Farm and Ranch Equipment. Her family’s Dunnville, Ky., company advertises on “Larry’s Country Diner,’’ and “All-American Cowgirl Chicks,’’ and she has a great affection for both Gottsch and his enterprise. Two recent RFD-TV moves say much about the network’s Nashville connection. The George Jones memorial service held May 2 at the Grand Ole Opry House was aired nationally on both RFD and FamilyNet. Another project that excites Kantz involves a tribute to the Professional Bull Riders, which is taped in Nashville. “We’re going to be airing the top 20 events from the PBR. They’re at their 20-year mark,’’ she adds. Bernard, who previously served as CEO of both PBR and IndyCar Racing, says additional live Western sports events are important to the network’s growth. “We just signed a deal with the National Cutting Horse Association, where we are going to televise their Triple Crown in 2014. And this is a big deal,” he adds. The Omaha World-Herald also recently reported that Gottsch’s long-range plans call for production to move closer to corporate headquarters. Of a possible production move out of Nashville, Bernard says nothing is imminent. “Right now, let me start by saying we love Nashville. I think if you’re going to do anything with country music, I think it’s sure the best place in the world to be. And classic country has always been such an ingrained part of Nashville, it just feels right and makes sense,” he says. Grant Barbre, president of NorthStar Studios, understands why Gottsch might want to relocate closer to home, but says Nashville offers much more. “I think everybody has a desire to work out of their own backyard. I respect that,” Barbre says. “We value them as a client. They have been with us for eight years. So part of me wants them to stay, and part of me wants them to grow, so we hope we can grow with them and he may not need to go to Nebraska. If such a move happens, Black adds, it wouldn’t affect Larry’s Country Diner. It would still tape at NorthStar and be uplinked just as it is now. “Northstar is not going anywhere. Time will tell if that becomes a reality,” Black says. “It’s like me with the blue-sky approach to a performance venue (being built in Nashville with a brick-and-mortar Larry’s Country Diner).